The Law Offices of Indra Lahiri provides exceptional legal service to those needing representation in any type of civil litigation case or in and around Bakersfield. Founded in 1984 by Bakersfield litigation and transactional lawyer Indra Lahiri, the legal team has more than four decades of experience, both in and out of the courtroom. The attorneys at the firm handle business and personal injury litigation as well as the occasional major felony criminal case. They also draft and prosecute patents, file trademark and copyright applications, draft contracts, license agreements, and business filings, as well as engage in advising companies regarding employment litigation and compliance with federal and state law. Attorney Lahiri graduated in law in 1977 from St. Catherine's College Oxford and in 1978 as a Barrister-at-Law of Lincoln's Inn, England. He practiced for a year as a trial lawyer in Manchester, England before locating to the United States where he was qualified to practice in California and the United States Federal Courts in 1981. His prior experience includes working as an associate in a California civil litigation firm before founding his own firm, which he has operated continuously since, emphasizing litigation, both civil and criminal. He has an extensive history of litigation, including a death penalty jury trial in which he saved his defendant from the gas chamber, a $750,000 jury verdict against a local bank for fraud against its customers, a class action case settlement against a Bakersfield credit union representing 15,000 members who were charged illegal fees, and a wrongful death settlement for $5,000,000 against a Fresno farming corporation. If you need legal advice in any business or transactional matter, including international transactions as well as experienced legal representation in business litigation, federal litigation, personal injury cases, or any other type of civil lawsuit, the firm provides personalized attention, consistent communication at all stages of the legal process, and a commitment to excellence. Due to a track record of successful results, you can be confident that your legal issue, whether pertaining to employment law, intellectual property, or civil litigation, will be handled with the utmost care and attention to detail. It is recommended that you contact the firm to schedule a consultation about your situation in order to be advised about the legal factors involved as well as your options for bringing it to a satisfactory resolution. 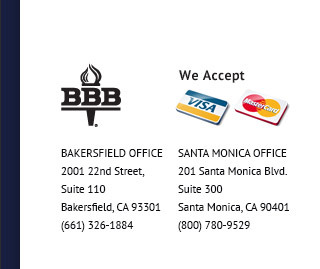 Contact a Bakersfield litigation attorney at the firm for experienced and skilled legal representation today.